Beijing City Guide. China Travel Services. CTS. Los Angeles. San Francisco. Travel to China. China Travel Service. Beijing, located in the North, has been China's political and cultural center for the last 800 years. Reigning as both an ancient capital of Imperial China and the modern capital of a thriving nation, Beijing retains plenty of evidence of its royal past, with aristocratic parks, temples, and palaces (all open to the public). Beijing is home to an incredible cultural display of art and historical artifacts in more than 50 museums, folk traditions that flourish in theaters, delicious dining in exotic settings, and cultural centers with fascinating demonstrations of centuries-old arts and crafts. Nowhere else can you get a more concentrated impression of the old and new China. Beijing is the treasure trove of Chinese culture, where many of the sights that make China a world-class destination are located. Perhaps one of the conspicuous differences between China and the West is that the Chinese do not attach much importance to signatures, preferring to use chops. From ancient imperial courts to modern government offices, and from emperors to ordinary citizens, it is common to use chops for official documents and for personal affairs. So while you are in Beijing you may want to buy one. Large hotels provide a service for carving chops. The carver can help you choose a Chinese name to carve on the chop, or you can ask a Chinese friend to give you a Chinese name. The seal makes an interesting souvenir, or a personalized gift for a family member or friend. Don't forget to buy a small box of red paste to use with your seals. The price for seals, which are made of stone, wood or metal, can vary a great deal. These are mainly made of glass, though jade, crystal, agate and jadeite are also used to make the precious ones. They are pretty in shape, but their unique feature is that the paintings are done from the inside. The artist begins by making a small flat bottle. Then iron sands are put into the bottle and shaken to make the inside of the bottle turn a smooth milky white. After cleaning, a bamboo painting brush with a bent tip is used to paint the inside of the bottle. Since the bottle is small and its neck narrow, the painting requires extreme skill. The paintings are normally of flowers, birds, landscapes, calligraphy, beauties, or scenes from history or legend. The earliest known jade artifacts date back to the Shang and Zhou dynasties (approximately 3000 years ago). The materials used include all kinds of hard stones, such as jadeite, nephrite, red agate, white agate, crystal, amethyst, coral, ruby and sapphire. It is a special skill to exploit the natural color of a piece of jade to create an effective design. The most expensive ones are not those of one single color, but those of multiple colors, in which the artist has skillfully incorporated the different colors into the carved design. These jade carvings are highly collectable. Cloisonné, one of the traditional arts and crafts of Beijing, is an enamel handicraft made with roughcast brass and copper wire inlay. The cloisonné process begins with the casting of bronze into different shapes, such as vases, bowls, boxes, and even bracelets, onto which flat copper wire is then affixed in decorative patterns. Enamels of different colors are applied in the spaces between the wires. Each cloisonné piece is fired three times, with a fresh coat of enamel each time. After firing, the pieces are ground and polished to look like gold. This requires sophisticated technique and artistic flair. Chinese cloisonné received first prize at the Chicago World Fair in 1904. Paper-cuts are an old folk handicraft which has been produced for over 1,500 years in China. They were originally created for religious and ritual activities, but later came to be used for secular events as well. Today they’ve become a unique art form of their own, and have developed from single-colored to multi-colored. Peking (Beijing) Opera: China’s Peking opera is a national treasure with a history of over 200 years, incorporating various styles which eventually evolved into the present-day Peking opera, the most popular opera in China. Peking opera is a synthesis of stylized action, singing, dialogue and mime, acrobatic fighting and dancing. There are four main types of roles: the sheng, or male leads, mostly scholars, officials, and warriors; the dan, or female roles (usually played by men); the jing, or painted-face roles, mostly warriors, heroes, statesmen, adventurers and demons; and the chou, or clowns, which can be either male or female. The stories are taken mostly from legends and important historical events. The costumes are elaborate and many are intricately embroidered; the facial makeup is rich and varied with many traditional makeup designs depicting the different characters. The Palace Museum was the palace of the Emperors of the Ming (1368-1644) and Qing (1644-1911) Dynasties. It is the largest and best-preserved ancient building group in China. Constructed between 1406 and 1420, and rebuilt many times since, the Palace covers an area of 720,000 square meters, and includes 980 buildings of 8700 rooms. 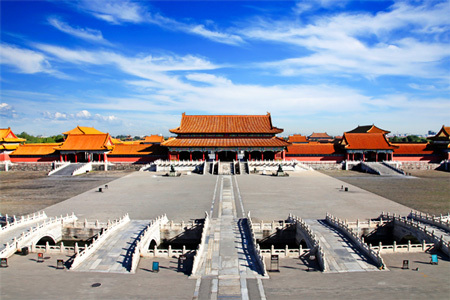 Laid out in strict symmetry, the buildings embody the fine tradition and unique style of ancient Chinese architectural art. The Museum has a collection of more than a million items. These include articles of daily use by the emperors, empresses and consorts, stone tablets and carvings, gold and silverware, ceramics, lacquer ware, cloisonné, enamelware, items used for calligraphy and painting, textiles, clocks with frames embedded with precious stones, and many other valuable articles which had been amassed by the imperial court. Known to the Chinese as the "10,000 Li Wall", the Great Wall was constructed 2,000 years ago during the Qin Dynasty (221-207 BC). It stretches from Shanhaiguan on the east coast to Jiayuguan in the Gobi Desert. The total length is said to be over 5,000 km. It took thousands of laborers and 10 years of hard work to complete the construction. The purpose of the Great Wall was to stop invasions from the north. Today the Great Wall has become a symbol of China and is the only man-made construction on earth visible from space. Traveling past Changping County northwest of Beijing, one reaches an 18.5-km long valley called Guangou (Pass Gully), in which four barriers were erected – Nankou, Juyong, Shanguan, and Badaling. The northernmost of the barriers at Guangou, Badaling has long been referred to as the Northern Gateway. The wall here averages 7.8 meters in height and has a width of 5.7 meters at the top and 6.5 meters at the base. The walkway on top of the wall is 4.5 meters wide, making is possible for five horses or ten soldiers to march abreast. With large, heavily fortified towers found along the wall every 300 to 500 meters, Badaling is known for its imposing magnitude. Located 10 kilometers south of the Badaling section of the Great Wall and built in an 18.5-kilometre-long valley, the pass has always been an important gateway northwest of Beijing. The name, translated as “Pass of the Conscripted Laborers”, is believed to have its origin in the workers and slaves conscripted to build the Great Wall in ancient times. Located 70 kilometers northeast of Beijing, the Mutianyu section of the Great Wall is known for its beautiful surroundings of dense woods and rich pastures changing colors with each season of the year. It winds its way over a thousand meters to the crest of a mountain before turning sharply and dipping downhill, forming a triangle known as “Ox-Horn Wall”. Two unique features of this section are the double battlements and branch walls found throughout the area. At some places where the mountain ridges meet, the wall branches out in several directions. The watch towers on these “branch walls” controlled high vantage points to protect the main part of the Great Wall. In other sections, double sets of battlements were constructed to create additional obstacles for invading troops. The Jinshaling section is virtually a museum of the architectural styles of Ming-era towers. As many as 67 towers are found with a distance of only 10 kilometers. The towers are built in a surprising variety of shapes, the largest of which is the impressive “Storehouse Tower”. The Storehouse Tower, so named because of the storehouse on its southern terrace, was used as a garrison headquarters, and is protected by special defensive barriers and an extra wall 60 meters downhill. Located 110 kilometers northeast of Beijing, and to the east of the Jinshanling section, Simatai begins at the Simatai Reservoir. Here the wall travels along the ridges of high mountains and, at certain points, along cliffs formed by huge rocks, where builders were able to create an impregnable wall by merely piling up a few layers of bricks. The most distinctive features of this section are the stone overpass and the stairs leading up to the Fairy’s Tower. The stone overpass bridges the 900-meter-high peaks of the Kulong (Cavity) Mountain. Over 100 meters long, and narrowing in some places to less than 40 centimeters wide, it overlooks deep ravines on both sides. The overpass brings one to the “Heavenly Stairs” which lie along a mountain trail only wide enough for one person. The 30 or more stone stairs have a gradient of some 70 degrees and are each 60 to 70 centimeters wide, though only 30 centimeters are usable. East of the Fairy’s Tower is the highest point in the Simatai section – the Tower for Viewing the Capital, from where on a clear autumn night people can see the lights of Beijing. Huangya Pass acquired its name from the yellow cliffs into which it was built. Built across the Ju River in Jixian County, the pass and its round guardhouse, Phoenix Tower, have an imposing look. The most unique feature here is the Street of the Eight Diagrams, an architectural wonder of the Ming Period lying just below the pass. A labyrinth meant to confuse and entrap invading armies, this fortification’s design is based on the ancient trigrams of the Book of Changes. About 2 km southeast of the Forbidden City towers Tian Tan, or the Temple of Heaven. Built in the Ming Dynasty, it is where the Emperor of China, also called the Son of Heaven, would pray for good harvests. The temple, including its subsidiary buildings and a surrounding garden, covers an area five times the size of the Forbidden City, and is the finest example of Ming dynasty architecture in Beijing. The circular wall surrounding the Imperial Vault of Heaven is 193.2 meters long, 3.7 meters high and 0.9 meter thick. If one speaks against the wall at one end, another can hear his voice at the other end. Also known as Qigu Hall, it was the spot where the emperors of the Ming and Qing dynasties prayed for good harvest in spring. This umbrella-like structure of three tiers stands on a six-meter-high white marble circular terrace and is 32 meters high and 24.2 meters around at the base. Built in 1651, the Gate of Heavenly Peace is located in front of the main entrance to the Forbidden City. Across the street is the Square named after the gate. Covering 110 acres, it is the largest public square in the world. Surrounding the square are many of China's most impressive monuments, government buildings, and museums. Mao Zedong's Mausoleum and the Great Hall of the People legislative building are located on either side of the square. The grand ceremony of raising the national flag is held in the Tiananmen Square everyday. The honor guard soldiers of the People's Liberation Army raise the flag at sunrise and lower it at sunset, accompanied by martial music. Located in the suburbs of Beijing, The Summer Palace was formerly an imperial garden and palace for the Qing emperors. One of the four famous gardens in China, it is now divided into three sections: political, living and sightseeing. Today, you can stroll along the famous 700 meter Long Corridor, with its beautiful Painted Gallery (each archway depicts a different scene), and enjoy a peaceful afternoon next to Kunming Lake, soaking in the majesty of China's imperial past. Famous features such as the Marble Boat, Longevity Tower, the 17-arch bridge, and several magnificently painted pavilions are stunning examples of Chinese architectural style. The most renowned Tibetan Buddhist temple in China outside of Tibet, Yonghe Gong is an active temple with finely detailed Thangka paintings and beautifully carved and cast Buddha images. The Ming Tombs lie in a valley to the south of the Tianshou Mountains in Changping district, about 48km (30 miles) northwest of Beijing. The tombs are set into the hillsides sheltering well-preserved artifacts of 13 emperors from the Ming Dynasty (1368-1644 AD). The entire complex covers all 13 hillsides of the valley. The main tomb of Emperor Wanli (1562-1620 AD) is open to the public for exploration; some sections have yet to be excavated. This is another excellent example of the grandeur of the Ming dynasty. On the west side of the Forbidden City is a wide expanse of water called Tai Ye Chi. Tai Ye Chi is divided into three parts: Beihai Lake in the north, Zhonghai Lake in the middle, and Nanhai Lake in the south. Beihai, the best known of the three, was turned into a royal garden as early as 1,000 years ago. Hutongs are narrow lanes winding between traditional quadrangle dwellings in old Beijing. They are found around the area of the Forbidden City, and many date to the Yuan (1206-1341), Ming (1368-1628) and Qing (1644-1908) dynasties. The traditional quadrangle is a courtyard enclosed on four sides by one story residences. The Hutongs are actually passageways formed by the many closely arranged quadrangles. Standing on the eastern flank of Tiananmen Square, this national museum collects, preserves, and researches the artifacts, relics and historical materials from the Paleolithic Age to the First Opium War of 1840. Boasting a collection of more than 300,000 pieces, the museum is renowned for its Shang (1600-1046 BC) and Western Zhou (1045-771 BC) Dynasty bronzewares, for breath-taking terra cottas and jade artifacts of the Neolithic Age, and for Tang Dynasty (618-907) tri-colored figurines. The Capital Museum, located in the Beijing Confucius Temple, is a state-run comprehensive museum whose main exhibition is the Display of Historical Relics unearthed in the Beijing area, such as stoneware, bronzes, ceramics, steles, calligraphy works, paintings, jade ware and ancient coins, highlighting the history of the ancient city. Erected on the site of the cave dwelling of Peking Man (Sinanthropus pekinensis) in Zhoukoudian in the southwestern suburbs of Beijing, the Museum’s main focus is the research of natural history. Included in its collection are 3,000 articles consisting mainly of Peking Man’s bone fossils, stone artifacts, traces of Peking Man using fire, and fossils of animal bones. The Dabaotai Western Han Dynasty Tombs Museum is located in Fengtai District, Beijing, covering an area of 18,000 square meters. The museum is built around the tomb of Liu Jian (73-45 BC), the prince of Guang Yang of the Western Han Dynasty. The main attraction in the museum is this massive tomb with its spectacular remains, which are characteristic of the culture of the period and thus provide valuable materials for studying the Western Han Dynasty. The National Geological Museum of China, situated at Xisi, Beijing, is the largest geological museum in Asia with more than 120,000 items in the collection, including rare treasures such as the huge dinosaur Shandungosaurus giganteus, the king of quartz crystals, and primitive bird fossils. The museum displays are shown systematically in the Hall of Geological Resources, the Hall of Earth History, the Hall of Minerals and Rocks, and the Hall of Gems and Jades. The gallery boasts more than 60,000 pieces of artworks by modern and folk artists. These include Chinese watercolor and ink-and-wash paintings, oil paintings, block prints, sculptures, posters, cartoons, gouaches, illustrations from literary works, lacquer paintings, and many others representing the artistic styles of different schools and times. Barbecued Meat is a Manchu food. Meat, mainly beef or mutton, is cut into thin strips or slices, and then soaked in a mixture of soy sauce, crushed ginger, wine, shrimp paste, sesame seed paste, rice vinegar and chopped coriander. The meat is then barbecued over a highly-heated grill before it is served. Fangshan (Imperial-style) Restaurant sits on the island in Beihai Park in a traditional courtyard facing the lake. A newly-opened branch of restaurant of Fangshan style, Yushan Restaurant, is located a few hundred yards to the west of the north gate of the Temple of Heaven, in the southern part of the city. 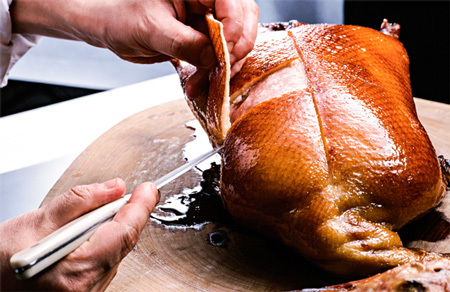 Tingliguan (Hall for Listening to the Orioles) Restaurant, in the Summer Palace, serves more than 300 dishes and pastries from the Qing and Ming imperial recipes. The All-fish Feast is a specialty of the restaurant. The hot-pot is a traditional brass pot with a wide outer rim around a chimney with a charcoal-burner underneath. Water is heated to boiling in the rim, and the diners dip thin slices of raw meat in the water, where the meat cooks quickly. The cooked slices are then dipped in a sauce. There are vegetables, bean noodles, mushrooms and bean curd to be boiled in the rim as well. The sauce is prepared personally by the diner by selecting from a few dozen kinds and mixing together to suit their own taste. The traditional food to accompany the hot-pot is buns or noodles. The classic Beijing breakfast snack sold by street vendors is definitely worth trying - vegetables wrapped in an omelette wrapped in a pancake - deftly made in thirty seconds. This is the largest and busiest market street in Beijing. Its southern end connects to the East Chang'an Avenue where the Beijing Hotel is situated and its northern end to Jinyu Hutong where the Palace Hotel stands. Lining the street are many old specialized stores, bookshops, and department stores. The Beijing Department Store is the center of the market street, and at the site is the Dong'an Mall. For newcomers to Beijing, it is an ideal and safe place to shop since most of the shops are state-run, and you will not be cheated or overcharged. Located in the southwestern part of the city, Liulichang is a traditional market of old and rare books, antiques, paintings, calligraphy, and arts and crafts. It is one of two streets which still bear the appearance of a Qing Dynasty market street (the other is Suzhou Street in the Summer Palace, mainly for show purposes). It is an ideal place to shop for those who love antiques or arts and crafts and is worth going to have a look at the street itself. Beijing’s Capital Airport has international flights to many major cities worldwide, and domestic flights to most cities in China. There are three underground trains that operate from 5:30 am till 23:00 pm in the downtown of Beijing called Line One, Line Huan and Line Fuba. There are five main railway stations in Beijing, the largest of which is Beijing West Railway Station (West Station). Traveling by train can be a relaxing way to see China’s countryside. Taxi costs varies. Please consults your hotel.